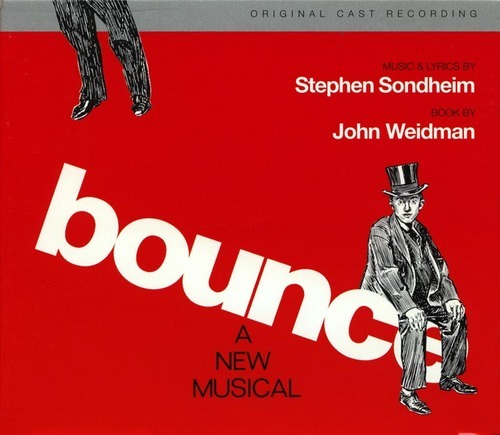 Let me begin this by saying that Stephen Sondheim is one of my favorite composers and several of his scores are among my favorites so, except the fact that he should write musicals more often, I don’t have anything against him. I was expecting something really special for his first musical in years and I wasn’t prepared to feel disappointed by it, but that’s what happened. This recording begins with an exciting "Overture" that promise a lot and it’s followed by a good and hummable title tune. There’s plenty to enjoy in what follows, but by the end you get the idea that all songs sound almost the same and that makes this score kind of monotonous. Don’t get me wrong, the orchestrations are great and the cast is in good shape (although I don’t like Richard Kind’s singing voice), but this isn’t Sondheim at his best. Among the songs my favorites are, besides the title number, the romantic with a twist “The Best Thing That Ever Has Happened”, the haunting waltz “Next to You”, the rousing “You”, and another interesting Sondheim song about art “Talent” (beautifully sung by Gavin Creel). There’s also the funny “Addison’s Trip”, two big productions numbers “I Love This Town” and “Boca Raton” and the melodic “What’s Your Rush”. The problem is that all these songs are quiet similar and some of them and more than reminiscent of PASSION, INTO THE WOODS, MERRILY WE ROLL ALONG and A FUNNY THING HAPPENED ON THE WAY TO THE FORUM. On the plus side this is better than most new musical scores and after a few listening it kinds of grow within you. As for the cast, besides Kind and Creel, Howard McGillin and Michelle Pawk give their best to the songs and it’s a pleasure to hear MGM’s old glory Jane Powell once again.